The significance of Vipassana, the most ancient meditation technique of India, can be found in all the prominent scriptures of India including the Vedas, the Bhagvad Gita and Patanjal Yoga. The founder of every religion also expounded these same eternal teachings. After attaining enlightenment by rediscovering the technique of Vipassana meditation, the Buddha also uttered the words “This is an ancient path….this is an eternal path”. 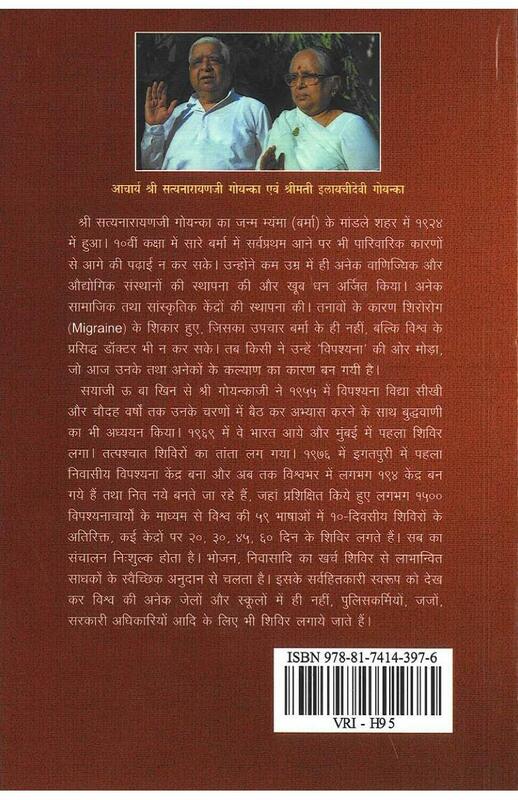 This book contains the discourse delivered by Mr. S N Goenka at Jaipur on the occasion of Yoga seminar in which he explains significance of Vipassana in the ancient scriptures and how Patanjal Yoga and Vipassana are exactly the same. He also expounded the meaning of various terms used in Yoga and its teaching from the perspective of actual experience. He describes how with the passage of time, the true essence of every religion got lost and elucidated the identical nature of different religions of the World, by sharing experiences of students of different religious backgrounds who attended Vipassana courses. Along with explaining the difference between Dharma and religion, this discourse also provides an interesting insight into the human mind and its structure.